Patek Philippe 5053R-001, made in 18 karat rose gold with officers hinge back case and see through dust cover. This watch was made in 2003, and comes complete with its original certificate of origin, leather wallet, and box. The watch uses a 315 SC caliber automatic movement. 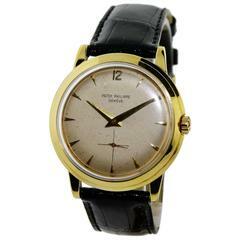 This example in in like new old stock condition with new Patek Philippe Alligator Strap.